Copyright 2010 (c) e-Court US Legal Services International LLC. Material displayed on this website may not be published, broadcast, or redistributed. e-Court content may not be stored except for personal, non commercial use. Republication and re-dissemination of e-Court content is expressly prohibited without the prior written consent of e-Court. 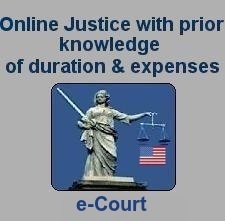 The services and materials are provided by the e-Court site on an "as is" condition. e-Court disclaims any and all warranties, expressed or implied. In no event shall e-Court be liable for any direct, indirect, incidental, punitive, or consequential damages of any kind whatsoever with respect to the services, materials, or products accessed through the site.